To commemorate it's 10 anniversary, GQ Korea held a party along with Louis Vuitton on February 24, 2011 at Louis Vuitton Cheongdam-dong, Kangnam-gu. Son Tae Young (손태영) arrived at the event wearing a modified dress from Louis Vuitton Resort 2011 which Sofia Coppola wore to the 67th Venice Film Festival. It definitely looks like the perfect "Little Black Dress" on her. Her outfit was styled with a clutch and sandals from Louis Vuitton Spring/Summer 2011. Kim Jung Eun (김정은) wore the green puffy dress which we saw on Kim Tae Hee (김태희) and Huo Si Yan (霍思燕). I didn't like the length of the dress on her and I thought she over accessorized the look with bangles on both wrist. The pink/purple bangles also didn't match the dress well. Jung Woo Sung (정우성) opted for a blazer with LV's signature print all over. 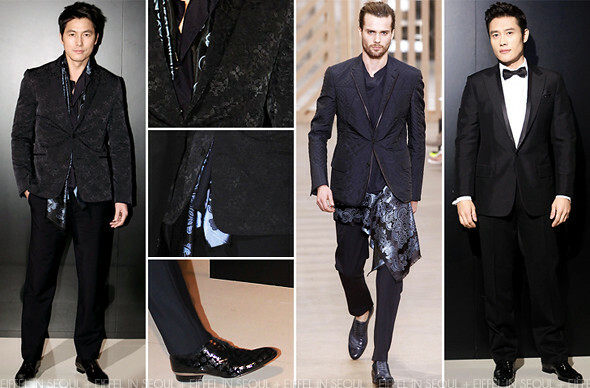 He spiced up the outfit with a scarf from Louis Vuitton Spring/Summer 2011 Mens collection. I love how the brogues with LV prints all over compliment his blazer. Lee Byung Hun (이병헌) turned up in a tuxedo, although it might be true most men look dashing in a tuxedo.. it was boring for me. I'm so glad it was not the case for Jung Woo Sung (정우성). My best dressed were both Son Tae Young (손태영) and Jung Woo Sung (정우성). I would love to see Louis Vuitton Spring/Summer 2011 collection grace the red carpets in South Korea in the future.